Scott Greer as Rizzo and Damon Bonetti as a reporter in Philadelphia Theatre Company's production of "Rizzo" by Bruce Graham. Who're ya gonna vote for? Today, that question divides Philadelphians no less than it did in 1991, during the final mayoral bid of Frank Rizzo, who served as Philly's mayor from 1972-1980. And the issues - race, crime, safety - that fractured the city and the nation then, still split the blues and the reds 25 years on. Bruce Graham uses that 1991 election as the launch point for Rizzo, which, after a successful run at Theatre Exile in 2015, transferred to Philadelphia Theatre Company for this remounted, larger production. Through flashbacks, movie-screen-sized projections of speeches, and reenactments of meetings and conversations, Graham's play dramatizes the humble origins of Rizzo (Scott Greer) as a son of immigrants, his rise through the police districts to Commissioner, and the brutal, often illegal tactics he employed during his rule over Philadelphia during the 1970s. Philadelphia Theatre Company's excellent ensemble fleshes out Rizzo's supporting cast. Steven Wright sizzles as the sharp-tongued civil-rights lawyer Cecil B. Moore (who battled to integrate Girard College). Amanda Schoonover gives deft portrayals of Rizzo's supportive wife Carmella and community activist Shelly Yanoff. 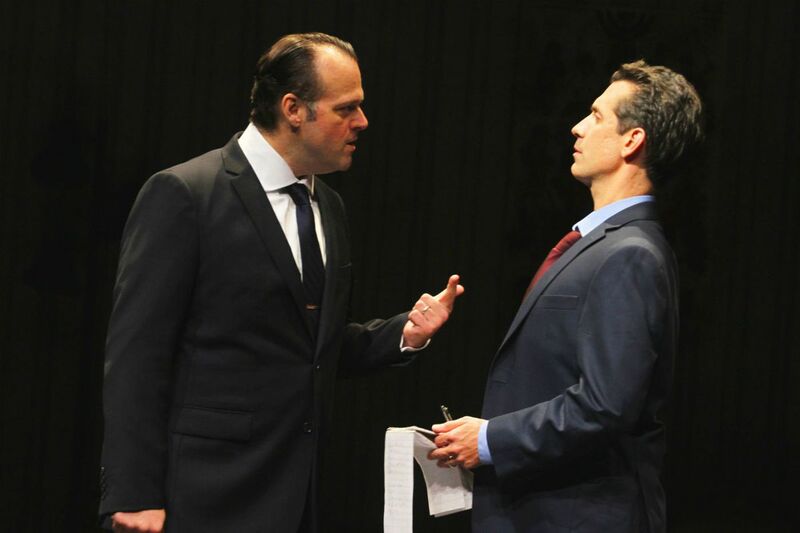 And Paul Nolan delivers a superb, sympathetic performance as Rizzo's ever-loyal lawyer, Marty Weinberg. Damon Bonetti's Reporter engages us as he narrates transitions between eras, although he questions Rizzo with a little too much contemporary snark. Shoulders set back, neck lowered like a bull ready to charge, Greer gives a performance at once admirable, polarizing, and detestable. But Graham's script and this staging transcend historical documentary. Christopher Ash's projections recall the Michael Radford's film 1984. Colin McIlvaine's set shows the formerly bleak (or at least bleak-er) landscape of our city. And Joe Canuso's direction finds tension in every encounter between the big man who dominated local political life and the enemies he imagines everywhere, seeking to undercut him. As local a subject as Graham's Rizzo is (he based much of it on former Inquirer writer Sal Paolantonio's book Rizzo: The Last Big Man in Big City America), this play resonates right now for this city, this nation. So strong is this resonance that a line meant to be topical - "We're gonna make Philadelphia Great Again" - while it referred directly to Trump, seemed an unnecessary addition to the 2015 script. Graham's work stands strong in our era, and it illuminates our country's past, present and future. Rizzo. Through Oct. 23 at Philadelphia Theatre Company, 480 S. Broad St. Tickets: $15-$62. Information: 215-985-0420 or PhiladelphiaTheatreCompany.org.